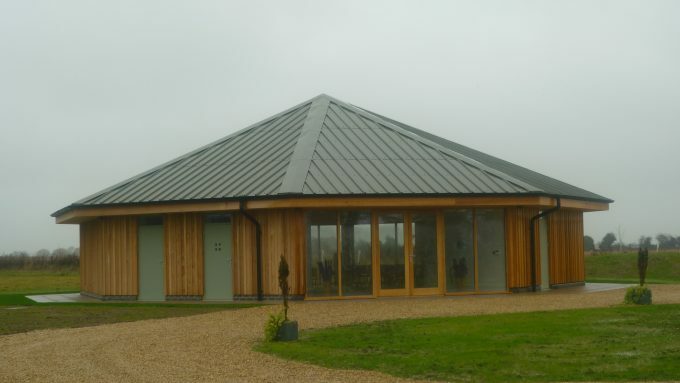 Norfolk Bluebell Wood Burial Park in Hainford, is a unique nature inspired burial park set amongst 18 acres of land. The land was purchased by the owners with the intention to use the land for agricultural purposes. When they discovered the ancient beautiful bluebell wood of 5 acres, it was carpeted with millions of spring blooms, they felt that the calming oasis of tranquility was destined to be somewhere that connected people and nature. 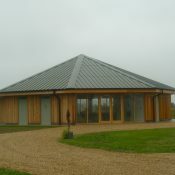 The concept of the Norfolk Bluebell Wood Burial Park was created and planning the construction of Cedar Hall, the ceremonial hall started. A marquee was erected as a temporary measure whilst construction was underway. 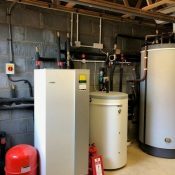 There was no mains gas available, therefore a renewable heating source was a natural choice and it also fitted with the ethos of the business. Phase 1, in August 2015, saw the installation of 900 metres of ground collector under the carpark and trenched to the proposed position of the hall, 900 metres of pipe was specified to ensure that enough heat is available for the end design. The final design was not set in stone at this point as only approximate sizes for the ceremonial hall were known at this stage. This work was done before the park was open to the public as it was important that work was done with consideration and limited disruption for any families or users of the park. 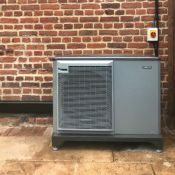 The ground conditions were damp sand, which is not ideal ground conditions for conducting heat, however this was taken into consideration in the heat pump technical design, the heat pump is designed to perform at 0°C brine conditions. The system is performing above expectations with brine temperatures averaging 4°C in the winter, this means the system is performing at an even higher efficiency than expected and using less electricity to produce the heat needed. 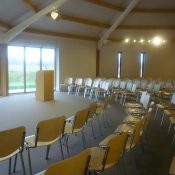 Phase 2, saw building work commence for the Cedar Hall, the ground loops were extended to the plantroom which is housed within a discreet section of the hall. 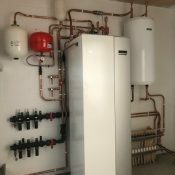 A NIBE F1255 12kW ground source heat pump was installed with weather compensation, allowing the system to run without intervention for extreme weather changes. 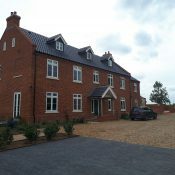 The ground source heat pump provides heat for the hall through 1200 metres of underfloor heating, it also provides 180L hot water for use in the kitchen and toilets. The system qualifies for the non domestic RHI which gives a return for using renewable technology. R A Brown fitted electricity and heat meters, the heat meters measure the amount of heat generated and payments are paid quarterly for the next 20 years based on meter readings. With these meters installed we are able to accurately measure performance, readings taken in December 2018 show that the heat pump is performing at 530% efficiency. Mrs Morton commented that “Cedar Hall has been really well received, it is very warm and makes the building feel really welcoming for our families, it is a nice environment. 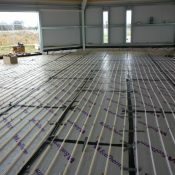 The underfloor heating works well with the design inside the hall as it is not intrusive or unattractive with radiators on display so doesn’t take away from the design of the actual hall. The estate was originally home of Robert Marsham who was the English naturalist and founding father of phenology – the study of the effects of the seasons on plants and animals which is now overseen by the Woodland Trust.